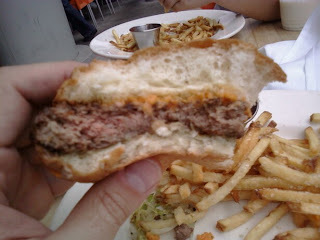 Today, I headed back to La Grande Orange in Santa Monica to re-sample the first cheeseburger that I tried in LA about a year ago. The last time that I went, the service was awful; the bun was a spongy monster; and the burger was bland and greasy. The cheeseburger was so blah, substandard, and disappointing that I didn't bother taking the time to review it. I hoped that things would take a turn for the better this time. Some foreshadowing occurred prior to our food arriving...Terry O'Quinn from Lost walked by our table...that set the tone for changing the past...partially....as on Lost....one can never truly escape one's past. The service was what I remembered...shoddy and lazy...hell, it deteriorated since the last time--the day crew on a Sunday was even less professional than the evening crew on a week day. The silverware was flecked with bits of dried on food--I tried several sets, and I finally gave up looking for a clean knife (after 3 tries) and just wiped one down. The bottoms of the plates were crusty with bits of other people's food from previous seatings. Good thing that I have a healthy immune system, because it seemed clear that LGO was doing its best to put my health to the test. 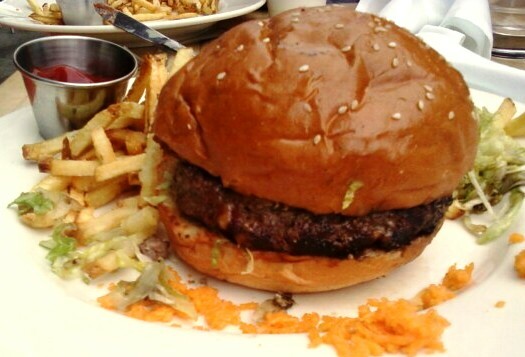 The wait staff knew nothing about the food--they couldn't tell me the cut of beef that was ground for the burger. While I was promised a report on the type of beef used in the burger, that never came to pass. One person of them claimed that the buns were baked in-house, and the other informed me that the buns came from the Melrose Bakery--there is no Melrose Bakery...there is a Melrose Baking Company, so maybe that's it. Either way, I found this level of bad service baffling in a weak economy. I ordered a cheeseburger with no greens and Dijon mustard on the side--my burger arrived with shredded lettuce on the bottom and no mustard. The pictures look like hell, because I had to scrape that crap off of my burger. Seriously--shredded, iceberg lettuce---who does that? WEAK! I ordered the $12 The Cheeseburger...ground fresh daily, and grilled over white oak. The Sear: In spite of being grilled, the sear was deep and rich. There was just a hint of char, and this sear had a satisfying crunch. That white oak fire burned hot and provided the perfect temperature and just bit of smoky flavor to round out the dish. The Seasoning: Hell yeah! The exterior was well seasoned. The Beef: I don't know what it was, but it was nicely aged, rich with beef flavor, and not greasy. It was very flavorful, high-quality beef. The Preparation: It was cooked to Medium--I ordered Med Rare. However, it retained its juices, so not too many points off there. The medium grind made for a meaty and satisfying mouth feel. The Cheese: Shredded, Sharp Cheddar, huh? 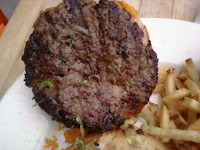 Yeah, it looked like hell on the plate and on the burger, and I assumed that it would flop, but it totally worked. The Cheddar worked its way into each bite as I chewed and blended perfectly with the beef to create a booming, hearty flavor profile. 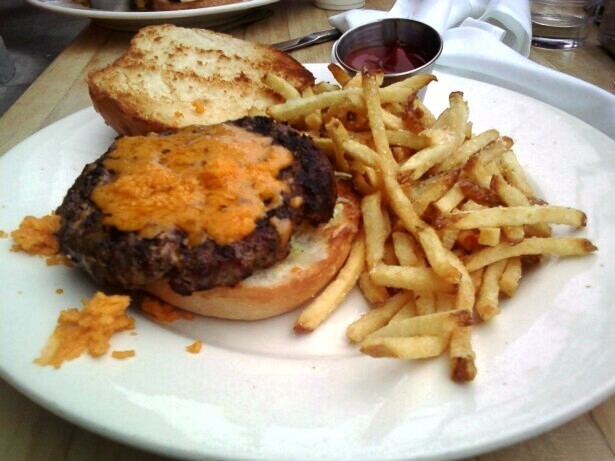 I thought, initially, that the amount of cheese was meager, but it was the perfect amount--the cheese had an immense flavor, and any more would have overwhelmed the well-seasoned burger. The Bun: Meh, the toasted, seeded, brioche bun was the real low point. It was too big and too spongy. Whether it was baked in-house (unlikely) or delivered by the Melrose Baking Company (more likely), it was heavy handed, gummy, ponderous, and inappropriate for the dish. 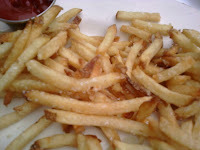 The Fries: Whatever they coated the fries in to make them stick together and crisp up (egg wash?) also caused WAY TOO MUCH sea salt to adhere to them, so the fries were crusted with flakes of salt to the point that they were pretty much inedible. Aside from the service, the bun, and the fries, this was a damn good burger. It had deep and powerful beef and umami notes, and the cheese brought the whole thing together to the point where it was very nearly a great burger. The texture, bun aside, were fantastic. I almost preferred this cheeseburger to the one at Comme Ça, because it was less oily and more manageable...the bun sunk it in this regard. Burger Review : Damn, that was a tasty burger with enormous flavor. Like Terry O'Quinn's John Locke character on Lost...this burger, and La Grande Orange, found some new life, but it continued to be tormented by persistent and pronounced shortcomings. Everything but the meat and cheese were awful. Rating...3 Bites If they manage to fix that bun, it will be a 5 Bites burger. They need to fix the service and general cleanliness, because it's the right thing to do...seriously, it was nasty. 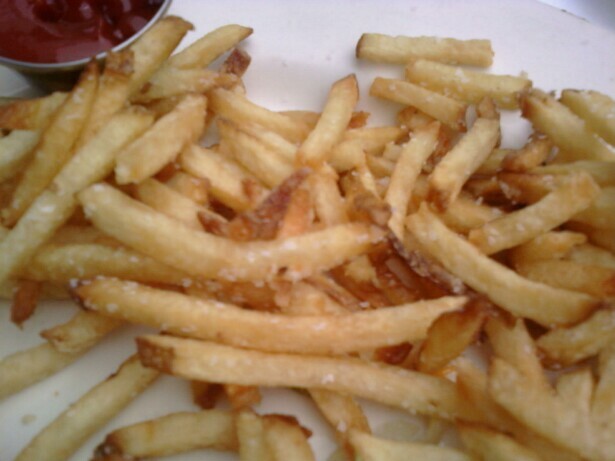 Fix the fries, because they are inedible.